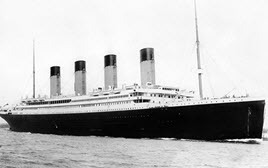 DHUnplugged #302: Take a Ride on the Titanic II? CDS – Credit Defaults Swaps blowing out in Europe as negative deposit rates are having a terrible impact. Tech stocks blowing up as earnings and outlook are really concerning investors. Oil continues to get hammered and now below $30 per barrel – even with the rumors flying around that there will be a special/emergency meeting with OPEC/Non-OPEC countries in an effort to stabilize prices. Japan market crumble, bond yields are dropping and all eyes are on the Fed’s next move. Listen in as we dive deep into the real news that matters most for investors. The biggest concern right now may be that China devalues the Yuan after the Chinese New year Holiday. The global financial situation is getting worse as seen by the Contingent Default Swaps (CDS) – remember those? Interesting: Last year, the number of dividend reductions far surpassed 2008. There has been a lots of talk about a potential U.S. recession. There are lots of voices that are protesting that concept. There are some areas that are clearly in recession. Oil at $30 a barrel is blowing a hole in the insurance that U.S. shale drillers bought to protect themselves against a crash. Companies including Marathon Oil Corp., Noble Energy Inc., Callon Petroleum Inc., Pioneer Natural Resources Co., Rex Energy Corp. and Bonanza Creek Energy Inc. used a strategy known as a three-way collar that doesn‘t guarantee a minimum price if oil falls below a certain level, company records show. While three-ways can be cheaper than other hedges, they leave drillers exposed to sharp declines. What is this all about? A record 4,279 individuals renounced their U.S. citizenship or long-term residency in 2015, according to data released by the Treasury Department. LinkedIn (LNKD) stock tumbles 50% after earnings release. Are advertisers feeling the pinch and finally giving up on some social media? (FB, TWTR follow lower after report) – We should have seen this coming – we knew Facebook had a new business service that was competition to LinkedIn. Disney (DIS) beats on both earnings and revenues…Stock slumps after hours. WHILE in attendance at the Super Bowl, Apple chief executive Tim Cook snapped a photo of the post-game festivities and shared it to his almost two million Twitter followers. BLURRY photo and followers gave him lots of crap about it. Daimler recalls 840,000 cars – potentially due to Takata Air bags —- When will someone put an end to this company manufacturing bad airbags?